The question of how to aggregate autonomous agents with limited abilities in the absence of centralized coordination is known as the Decentralized Gathering Problem. The authors present a bio-inspired aggregation scheme that solves this problem and study a first application of this scheme to a small team of robots. The robots (Alice and Khepera III) obey simple rules and have only a rudimentary perception of their environment. The collective behavior is based on stigmergic principles and uses an active environment to relay the communications between robots. This results in an aggregation process that shows good properties of robustness and that can in principle be extended to swarms of robots. Let us consider a system consisting of a great number of autonomous robots randomly spread on a plane area, the environment. The robots need to gather to realize a given task, for instance to exchange information about the area or to collaborate to remove an obstacle. In the case where the agents are not aware of their position, orientation nor of the presence of other agents in their neighborhood and if furthermore there are no means of centralized coordination or communication, the question of their aggregation is known as the Decentralized Gathering Problem. This problem has been studied using different assumptions about the agents and the environment. 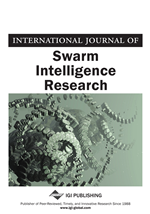 In an early work, Sugihara and Suzuki (1996) deal with the distributed coordination of a swarm of robots in order to form geometrical shapes. The work presented by Garnier et al. (2008, 2009) studies the emergent aggregation of robots that mimic the behavior of Blattela germanica, while Ando et al. (1999) and Flocchini et al. (2005) study the aggregation problem under the assumption of limited visibility. A theoretical study by Prencipe (2007) explored the complexity of the problem of decentralized gathering with simplifying hypotheses. One approach to solving the decentralized gathering problem consists of imitating the social amoeba species Dictyostelium discoideum (Fatès, 2010). The first approach of this aggregation scheme was made in the frame of cellular automata (CA) modeling. However, this scheme is more generic as it can be considered as a high-level behavioral description. The key idea is the existence of an active environment that conveys simple messages among the agents, the virtual amoebae. The agents interact with the environment by either initiating the transmission of a message or by detecting the existence of messages in their local neighbourhood. These two ingredients form the basis for a stigmergic behavior. The first advantage of this scheme is that both the agent description and the active environment are simple and straightforward to implement, at least in a simulation environment. The main idea behind the amoebae scheme is that the use of an active environment delegates to this environment parts of the complexity that would otherwise be implemented in the agents. In previous simulations, the aggregation scheme was shown to be robust to different perturbations of the agents and the environment, e.g., to the presence of obstacles and noise in the movement of the agents. The first aim of this paper is to investigate how to transpose the aggregation scheme in the case of robotic agents. The second objective is to examine whether the robustness of the aggregation process is conserved with robots. We examine two different series of experiments that use physically different implementations of the same active environment. The first approach we will present is based on the Alice micro-robots (Wikipedia, n.d.). These robots feature a compact design but have a restricted set of abilities: the robots we had at our disposal were equipped with only two sensors that could measure the light intensity of a source located above the robots. The second approach uses a modified version of the Khepera III robots, in conjunction with an “interactive table” (ROMEA) that has been specifically developed for conducting robotic experiments (Simonin et al., 2011). Although these robots have superior abilities, we made a minimalistic use of their features: our goal is indeed to present a simple method for aggregating the robots; in particular we want the experiment to be set rapidly without having to tune and calibrate too many parameters. This paper is organized as follows: We present the aggregation scheme while the next section describes the implementation on the two different types of robots. Following, we present the advantages and drawbacks that we observed during our experiments, as well as the differences we observed between the two types of robots and environment implementations. Finally, we discuss the results.